Anyone who has traversed up the bulbous convexity of a steep hill has made the sweaty decision that bicycles should come equipped with an alternative power source that does not involve leg muscles. Luckily the recent development of the e-bike, an electric bicycle that comes with a rechargeable battery-powered motor, has addressed this serious transportation concern. According to a 2014 report in The New York Times, e-bike sales are “surging” in Europe, with “250,000 e-bikes on the road in Switzerland and bike sales rising by over 9 percent in Netherlands”. Numerous start-ups in the Cambridge and Boston areas are looking to emulate the success of e-bike sales abroad, by engineering products that significantly reduce the physical exertion of riders while enabling an easy crossover from standard bikes to electric. Superpedestrian, a Cambridge-based enterprise, creates a novel design for the e-bike called the Copenhagen Wheel. This technology involves no necessary hardware to install other than the wheel itself, and therefore fits on most standard bicycles. The wheel’s motor is operated by a lithium battery which manipulates the torque on the bike’s back wheel to propel the vehicle 20 mph via power assist. And the best part? The speed settings for the Copenhagen Wheel can be controlled by a smartphone app. Superpedestrian, born from a collaboration between MIT’s SENSEable City Lab and the City of Copenhagen, plans to release its first consumer models by the end of the year. Evelo, another Cambridge-based company, was established a few years ago and advertises the “electrifying power” of its bicycles. Evelo bikes are equipped with Intelligent Pedal Assistance, which provides 3 options of riding with a mid-drive motor system. Further e-bike expansion is around the corner – Craigslist posts shared by the Boston Cyclists Union have hinted that another electric bike venue will be coming soon to Boston. Undoubtedly, these e-bike businesses are looking to capitalize on the relatively strong biker culture that already exists in Cambridge, a demographic that spans college students maniacally racing to class, leisurely weekend cyclists, and daily commuters pedaling to offices. Thus far, e-bikes have garnered attention in the US as a transportation option for the elderly and people with limited mobility. However, The New York Times states that e-bikes still represent a “niche” in the US. For e-bikes to experience commercial success in Cambridge and elsewhere in the US, these start-ups need to reach a broad target market and encourage standard bike users to transition to the electric version. The state of Massachusetts also has specific restrictions on motorized bicycles, that limit the speed of e-bikes to 25 mph and prohibit their usage on major highways or roadways where standard bicycles are not allowed. Another “speedbump” to e-bike sales might be price; the Copenhagen Wheel is priced at 799 dollars, and various Evelo models land at 2000 dollars. Certainly, there is fairness behind the upmarket price tag on e-bikes (remember the smartphone app? ), but it is up to electric bike companies to market this rationale appealingly to consumers. Regardless, for those cyclists who find pedaling to be tiresome and an exercise in redundancy…you now have your solution! 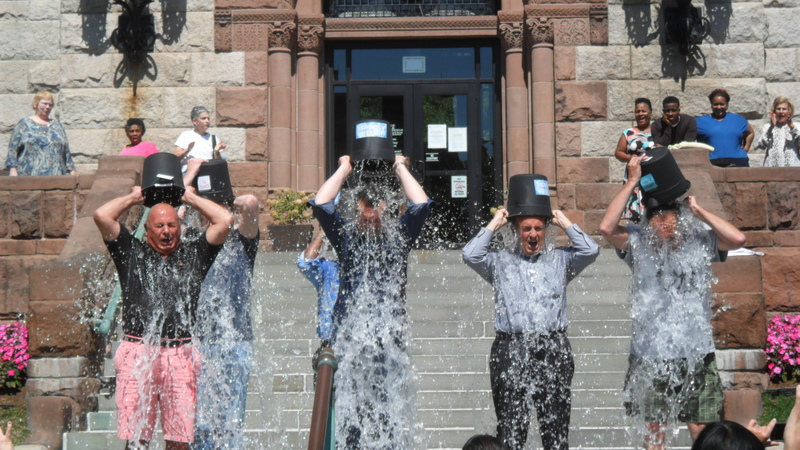 Cambridge Mayor David P. Maher and City Manager Richard C. Rossi, along with members of the City Council, School Committee, and City Staff, participated in an ALS Ice Bucket Challenge on August 20, 2104. The challenge was dedicated to current City employees who are battling this disease and to those employees who have lost their fight. Over 5,600 people in the U.S. are diagnosed with ALS each year. It is estimated that as many as 30,000 Americans have the disease at any given time. Ms. Vellucci was an employee at the King Open School (and the former Harrington School) who lost her four year battle with ALS. “I would do this challenge as many times as necessary if the awareness raised by this campaign could help find a cure,” said City Manager Richard Rossi. ALS is a progressive neurodegenerative disease that affects nerve cells in the brain and the spinal cord. The progressive degeneration of the motor neurons in ALS eventually leads to their death. When the motor neurons die, the ability of the brain to initiate and control muscle movement is lost. With voluntary muscle action progressively affected, patients in the later stages of the disease may become totally paralyzed. The ice and buckets were generously donated by Acme Ice on Kirkland St. in Cambridge. 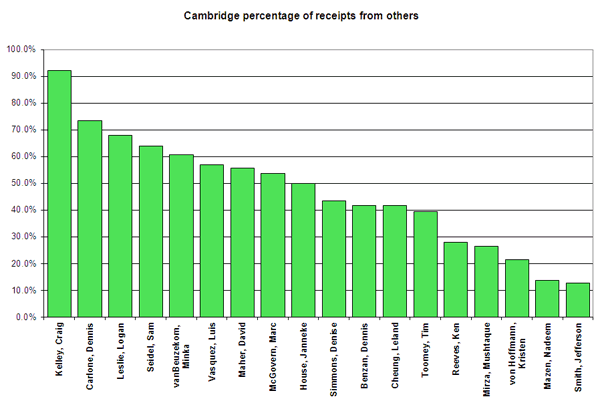 Note: Receipts include candidate loans which can greatly increase the percentage from Cambridge. Fees are included and reduce total receipts. 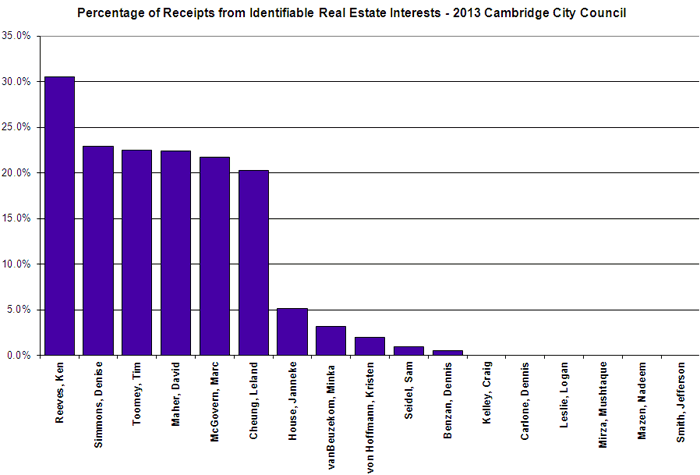 Percentages for unions/PACS and identifiable real estate interests (RE) are shown. The total receipts in the first graph below includes all receipts reported by the bank. Bank receipts in some cases do not match the reported itemized receipts. All figures taken from Mass. Office of Campaign & Political Finance (OCPF) reports. Two candidates in particular, Nadeem Mazen and Jefferson Smith, have financial reports that are especially difficult to decipher due to their liberal use of credit cards which resulted in some expenses being counted twice. I corrected the data as much as I could, but both campaigns could have used a competent treasurer. 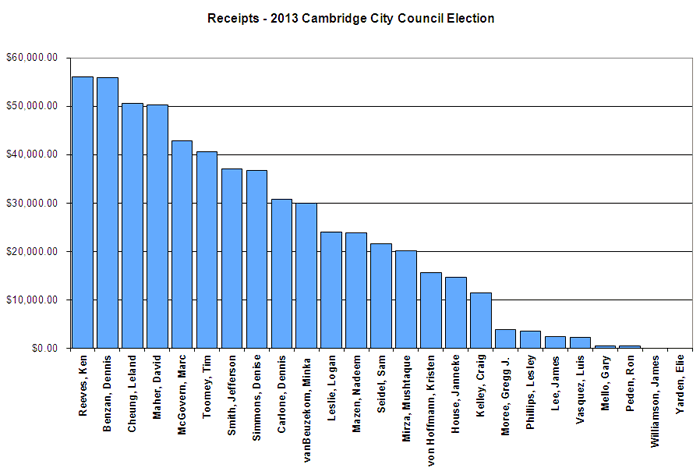 Additional information, including expenditures, may be found at http://cambridgecivic.com/?p=2660. These figures will be updated as additional information becomes available. Ms. Vellucci was an employee at the King Open School (and the former Harrington School) who lost her four year battle with ALS last week. Joining them will be several Cambridge School Committee members, City Manager Richard C. Rossi, several city department heads and City Hall staff. Vice-Mayor Dennis Benzan and Councilor Marc McGovern were recently challenged by former Cambridge City Councilor and Massachusetts State Representative Marjorie Decker. The Mayor’s office seized the opportunity to make it a group challenge on the lawn at City Hall, and to help create awareness of ALS. 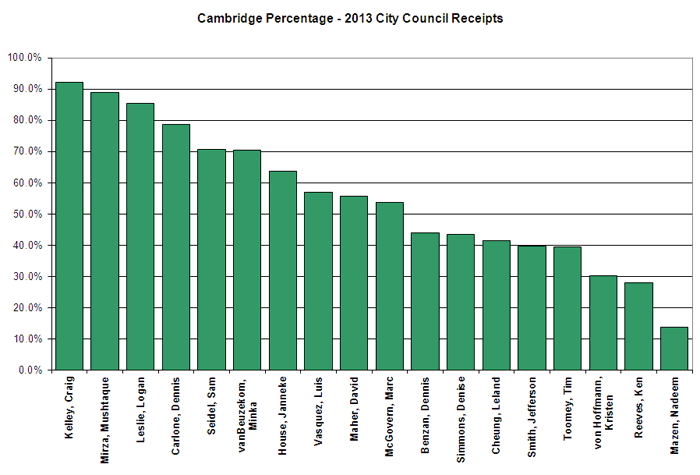 The Cambridge contingent will be challenging another local city to do the same. The ice and buckets will be generously donated by Acme Ice on Kirkland St. in Cambridge. Eric Law, owner of Acme Ice can be reached at 781-420-1332. For additional information, please contact Alanna Mallon in Mayor David Maher’s Office at 617-349-4327 or email amallon@cambridgema.gov.